St. Dunstan’s in Dover, Massachusetts can be very chilly in the winter months, and their sanctuary and classrooms have electric baseboard heat! That’s why a 2012 solar leasing program offered by MA IPL caught their attention. It was both affordable and would offset their high electric bills, while benefitting the environment and the climate crisis. The congregation participates in IPL’s annual Preach-In on Climate Change, and that helped their congregation understand the deep, moral rationale for reducing its carbon footprint. When installation was completed, they celebrated with a blessing by Bishop Bud Cederholm, and at the blessing service they kicked off a campaign to have members evaluate their homes for solar panels. Ultimately, 10 members signed up. 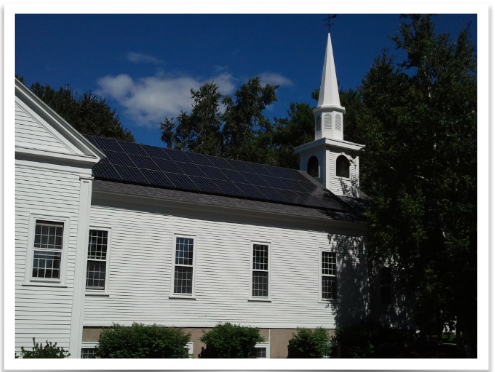 In 2013, St. Dunstan’s was one of 12 houses of worship to participate in the first Solar House of Worship Open House organized by MA IPL in collaboration with the Northeast Sustainable Energy Association. Members of the community came out to learn more about solar energy. Their solar system now prevents 10 tons of CO2 emissions, and it’s beautiful to gaze upon. While initially attracted by the savings, since electricity was the bulk of its energy budget, St. Dunstan’s now feels the larger impact has been the opportunity to decrease its carbon pollution and thus its contribution to climate change. St. Dunstan’s believes that because of the suffering climate change causes, especially to the poor and those in emerging countries, this is a response to Jesus’ call to care for those who suffer. In addition, due to the visibility of the system, they hope and pray that it will demonstrate to everyone who drives by that solar power is a practical technology today and inspire them to go solar as well.